What? No vampires in the early 50's? That decade was reserved for giant mutant ants and killer aliens. Where did that come from, UT? That data is from 2008. In 2010, PV generated about 2% of the total power mix in Germany, and it's still increasing in 2011, though they've reduced the FIT. 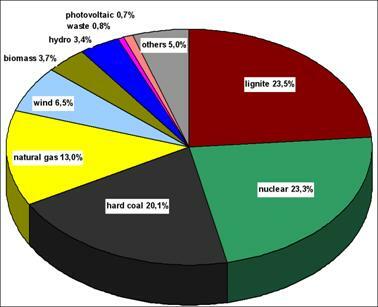 On the renewable side, wind power provided 6.2%, biomass 4.7%, hydro power 3.2%, photovoltaics 2% and waste power plants 0.8%. Here's US generation by source for 2009. Last edited by HungLikeJesus; 09-09-2011 at 11:49 AM. Creating solar energy is not the problem. Getting it to where it is needed/consumed is. Part of the solution could be Gov't spending on the transmission of the energy created, no? Apologies for the large image. It did not resize well. neat chart, but You could fit about 85.5 Cubas in the US. One of the big benefits of solar is that it's a distributed resource. Solar can be installed on just about every house, apartment building, office building, warehouse, freeway median, parking canopy, etc., which eliminates transmission and distribution issues and costs. It can also provide shading, reducing the need for air conditioning. Plus, it tends to be most productive during the hottest part of the day, further reducing air conditioning loads and reducing strain on the aging grid. I did not know EPA and IRS administer a program to tax gas guzzlers. In 2010 there were only 2 Ford- and 4 GM-models on the list. The others seem to be the more expensive (heavy) foreign cars. Why are these gas-guzzlers getting away with a one-time tax ? about 2000 gal of wasted gas to drive 25,000 miles (~ 2 years). half to pay for the wasted gas, and half as a penalty polluting the air around me. Well, there are state and federal taxes on gasoline, so they are paying a penalty for the extra gas they use.